The story revolves around two intertwined concepts. To begin, consider where we've been. When I was a kid, the technology that connected me to the outside world consisted of a television across the room and a telephone. The phone was hard-wired, the handset connected to the phone body by a coiled wire. In time, we advanced to the miracle of cordless phones, giving us the freedom to move around the house while we talked. Then came the cellular revolution. Flip phones at first, followed by the smartphones and tablet computers we enjoy today. These modern devices can be augmented with wireless earpieces, and visual devices like Google Glass. At a very basic level, what becomes obvious is this: as communications technology advances, the enabling devices--handsets, speakers, and screens--have become physically closer to our bodies. The venerable arms' length computer keyboard gave way to thumb typing with bent elbows. That, in turn, is being fast overtaken by voice recognition. We've reached the point where the next step is as obvious as it is revolutionary. Soon, probably within one generation, we will interface without any device at all. In March of 2017 Elon Musk, famed tech entrepreneur, publicly announced his latest venture. It is called Neuralink, a company whose stated mission is to develop implantable brain-computer interfaces. The first objective will be to advance the control of prosthetics, but the eventual goal is far more broad. In the parlance of Silicon Valley, it is referred to as "human enhancement. "Great advancements have already been made in fields that might augment such dreams--think retinal and cochlear implants, which are in use today to restore damaged sensory organs. And here enters the second part of my story. We live in a web-enabled world. Our cars and vacuum cleaners and cameras are all connected. The locks on our front doors. What if one man had not only the ability for a direct interface, but also unlimited access to pry into all those devices. Even take them over. Human enhancement indeed. The implications are profound, and I hope thought-provoking. 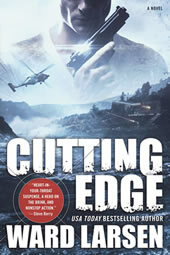 To that end, I give you Cutting Edge.